The town of Cahors, located in southwest France; was once the center of commerce during the Middle Ages that served as an important crossroads for pilgrims on the trail to Santiago de Compostella. The A.O.C. 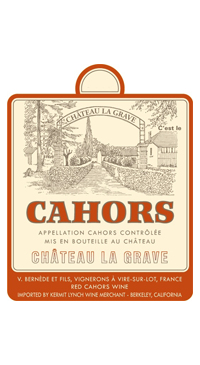 Cahors is known as the “black wine” of the Southwest; deeply inky, earthy wines. Cahors is also the birthplace of Cot, the grape more commonly known as Malbec. Château La Grave stands out as it is 100% Malbec, a rarity here in Cahors as most often the wines are blended with up to 30% Merlot or Tannat. La Grave is an incredible value on multiple levels—it is a hearty, full-bodied wine to drink now and a top candidate for your cellar.